AA Cystitab is a food supplement formulated to assist in the recovery from bladder infections (cystitis) and other bladder problems in cats. 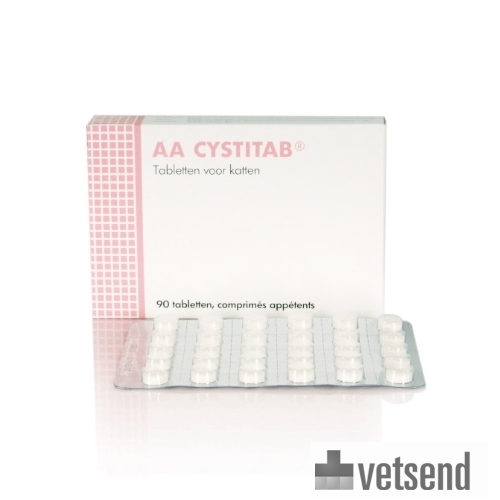 AA Cystitab is a food supplement formulated to support recovery from bladder and urinary tract problems. A form of idiopathic cystitis occurs in cats. If other causes are ruled out, such as bacterial infection, bladder stones/crystals, etc., idiopathic cystitis may be the problem. The cause is unknown but appears to be strongly related to stress. Reassuring cat pheromones such as Feliway reduce stress levels significantly, and can support the effectiveness of Cystitab. AA Cystitab binds to the defective bladder wall and urinary tract, reducing inflammation and promoting healthy bladder function. It helps to restore the damaged bladder wall and keep it healthy. Administer directly into the mouth, or crush and mix with food. First week: 1 tablet per 5 kg of body weight, twice daily. The following 3 weeks: 1 tablet per 5 kg of body weight, once daily. Maintenance dose: 1 tablet per 5 kg of body weight, every other day. Have you used AA Cystitab before? Let us know what you think about this product.